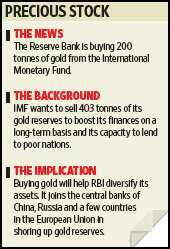 Mumbai: The Reserve Bank of India, or RBI, is buying 200 tonnes of gold from the International Monetary Fund (IMF), nearly half of what the fund plans to sell. In 1991, when India faced its worst ever balance of payment crisis, the country had to pledge 67 tonnes of gold to Union Bank of Switzerland and Bank of England to raise $605 million (Rs2,843.5 crore today) to shore up its dwindling foreign exchange reserves, which were then barely enough to buy two weeks of imports. India’s foreign exchange reserves were at $1.2 billion in January 1991 and by June, they were depleted by half. Currently, the Indian central bank’s foreign exchange reserves stand at $285.5 billion. In the last one year, China has increased its gold holdings, by weight, by 75.69%, Russia by 18.78%, the Philippines by 18.50% and Mexico by 108.91%. Compared with this, India’s central bank did not add anything to its gold reserves in the last one year, according to Bloomberg data. In fact, the share of gold in India’s total reserves has dwindled over the decade. In March 1994, the share of gold in the total reserves of the country was 20.86%; by the end of June 2009, gold constituted only 3.7% of the total reserves. An IMF spokesperson in India declined to comment on this development. RBI’s foreign currency assets consist mainly of sovereign bonds, mainly US treasurys. So, buying more gold will help the Indian central bank diversify its assets. “Gold as a proportion of our reserves is relatively small," said R.H. Patil, chairman of National Securities Depository Ltd and Clearing Corp. of India Ltd.
“Gold is the ultimate currency. In fact, only gold came to our rescue during (the) 1991 crisis, so it makes sense that RBI should try to increase its gold holdings," Patil said. RBI’s foreign exchange reserves consist of foreign currency assets, gold, special drawing rights (SDR)—an international reserve currency floated by IMF—and RBI funds kept with IMF. Out of RBI’s $285.5 billion foreign exchange reserves, foreign currency assets account for the most—$268.3 billion—followed by gold ($10.3 billion), SDR ($5,267 million) and reserve position in the IMF ($1,589 million). According to RBI’s latest annual report, the foreign currency assets consisting of foreign securities declined by Rs81,010.25 crore from Rs12.98 trillion on 30 June 2008 to Rs12.17 trillion on 30 June 2009 mainly due to net sales of dollars in the domestic foreign exchange market. At the current market value of $1,054 an ounce, or per 28.5g, RBI would need to spend about $7.4 billion to buy 200 tonnes of gold. With this, its gold reserve will rise to $17.716 billion, or roughly 6.20% of the total reserves. A committee set up by a group of central banks overseeing the gold sales by the IMF has allowed the fund to sell 400 tonnes of its gold annually and 2,000 tonnes in total during the five years starting 27 September. According to a report by the Associated Press dated 20 September, India, along with China and Russia, had evinced interest in buying IMF-held gold. At a total holding of 103.4 million ounces, or 3,217 tonnes, IMF is the third largest official holder of gold after the US and Germany. IMF’s total holding at historical price is valued at about $9.2 billion on its balance sheet. At market prices, as of 28 August, the fund’s gold holdings were worth $98.8 billion. Traditionally, India has been the largest importer of gold, with imports ranging between 400 and 800 tonnes a year between 2000 and 2008. 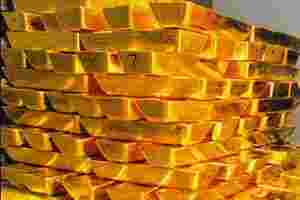 In the first half of 2009, gold imports have fallen drastically to 51 tonnes, according to the country’s apex bullion body the Bombay Bullion Association. According to a fact sheet on gold on the IMF website, the yellow metal played a central role in the international monetary system until the collapse of the Bretton Woods system of fixed exchange rates in 1973. Since then, the role of gold has been gradually reduced. However, it is still an important asset in the reserve holdings of a number of countries, and IMF remains one of the largest official holders of gold in the world.